Hunters Unlucky, by Abigail Hilton. Illustrated by Sarah Cloutier. Maps by Jeff McDowall. Winter Park, FL, Pavonine Books, July 2014, trade paperback $19.99 ([9 +] 672 pages), Kindle $9.99. “He walked in darkness. How long he’d been there, he could not say. Occasionally, he distinguished the silhouettes of rocks or faint light reflecting off pools of water. He stayed well away from the water. Sometimes he heard noises – rustling, the rattle of pebbles, a soft sigh like fur over stone. But he walked faster. He was looking for something … something he did not think he would find. He heard dripping, and that was normal, but then he heard a sharp patter, like an animal shaking water from its fur. Another swish, closer this time. I will not break. I will not run. Hunters Unlucky is a collection of Hilton’s five separate novels in that series; Storm, Arcove, Keesha, Teek, and Treace. They were also broadcast on her podcast beginning on November 10, 2014 and serialized two episodes per week through July 2, 2015. But they flow together smoothly into a single novel. Arcove, for instance, ends with a real cliffhanger. Get them all together in one handy book. 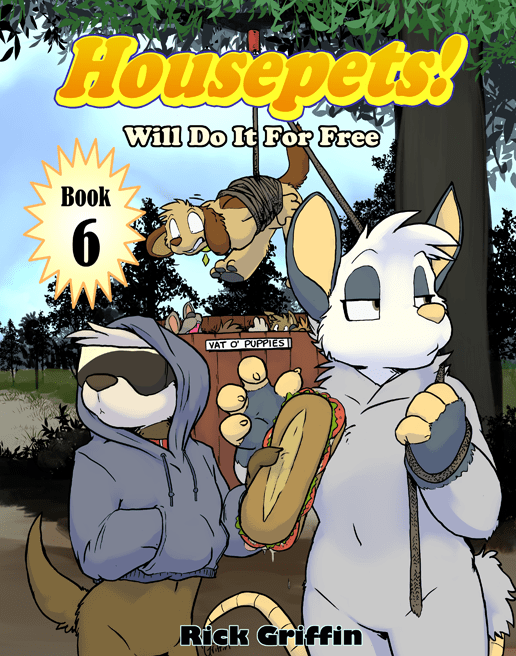 Hunters Unlucky has been compared favorably by many reviewers with Watership Down, The Jungle Book, the Warrior Cats series by “Erin Hunter”, and practically every dramatic natural talking-animal fantasy. It is different in being devoted (at first) to two groups of fictitious animals on the large island of Lidian; the ferryshaft, basically intelligent omnivorous furry deer or llamas, and the lion-like creasia cats. Other intelligent animals include the large foxlike curb, the eaglelike fly-ary, the telshee and the lishty, both sea mammals roughly analogous to furry sea lions. There are also many dumb prey animals such as sheep, rabbits, frogs, and turtles, which are sometimes eaten as well as grass by the omnivorous ferryshaft.